Thank you for supporting New Hope Academy through shopping and donating at ThriftSmart! 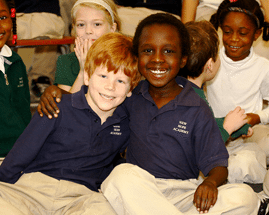 New Hope Academy is a Christ-centered community school with an economically, racially and culturally diverse student body. The school serves 220 Pre-K through sixth grade students at its 33,000 square foot facility that inclues 16 classrooms, a library, art and music rooms, and a computer lab. New Hope serves as a resource for schools across the country that want to achieve diversity and care for the poor.